Simply put GREAT LOVE is truly delicious! GREAT LOVE feels to me like the most amazing piece of chocolate cake you have ever eaten! It’s rich and satisfying. It gives you a rush of energy. It feels soft and gentle. It’s sweet and lovely. It makes you feel good. It feels like home. It’s enjoyable. It is filled with light. It makes you feel happy inside. It’s smooth and easy. It has several layers. Your soul knows when it’s good. It adds joy to your life. It’s exciting anticipating what it will be like to experience. It’s captivating and enticing. Once you see it you can’t stop thinking about it. You can always create more and start fresh. It is comforting when you are having a rough day. It takes several ingredients to get it just right. With warmth it keeps expanding and growing. It puts a BIG smile on your face. It makes others feel good just from observing it. Once you’ve tasted it you just want some more! I encourage you this week to make one aspect of your life more delicious! My picture this week came to me while I was driving home from the gym…I saw the hearts out the corner of my eye and just had to stop and take a closer look at the beautiful and delicious work of art. 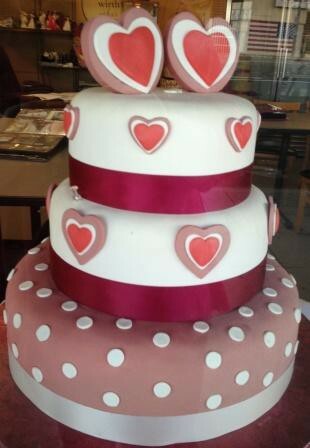 This entry was tagged Cakes, Chocolate, Chocolate Cake, Create Great Love, Delicious, Delicious Love, Great Love, Great Love is like chocolate cake, Happiness, Happy, Happy relationship, Heart Cake, Hearts, Helena Wirth Cakes, Love, Relationships, Rich, Smile, Soul. Bookmark the permalink. Thank you! What great wisdom!! Thank you Luanne I hope it is of benefit to you.